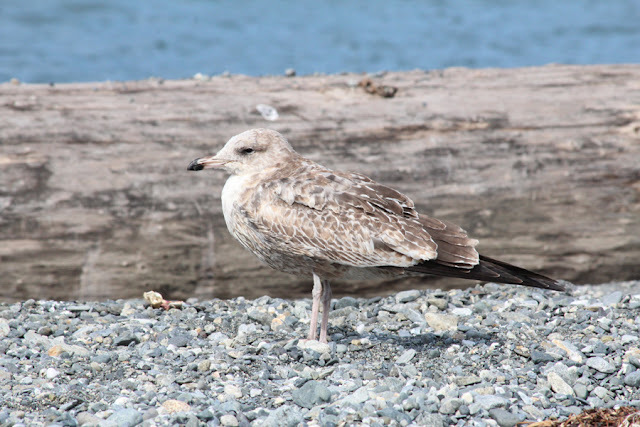 Migration is pretty much at its peak right now and I've been reading about some extremely tantalizing rarities from the Lower Mainland and Washington. Many of the recent vagrants have been shorebirds - Washington has had Lesser Sand-Plover (Charadrius mongolus), Ruff (Philomachus pugnax), Bar-tailed Godwit (Limosa lapponica), and Wilson's Plover (Charadrius wilsonia) along with Buff-breasted Sandpiper (Tryngites subruficollis), Stilt Sandpiper (Calidris himantopus) and Sharp-tailed Sandpiper (Calidris acuminata), while the Lower Mainland has hosted Sharp-tailed, Buff-breasted and Stilt Sandpipers and a Ruff, as well. The Wilson's Plover is just mind-blowing and something that is unlikely to be repeated any time soon, but wayward Asian shorebirds are never out of the question. Heck, we just had our own Sharp-tailed Sandpiper at McIntyre Reservoir less than a week ago! With that in mind, Jeremy K. and I decided to focus our efforts out west with a trip to Port Renfrew with stops at Whiffin Spit and Jordan River along the way. I could try to reinvent wheel and write a full report of this outing, but Jeremy K. already rolled up his sleeves and did the dirty work. 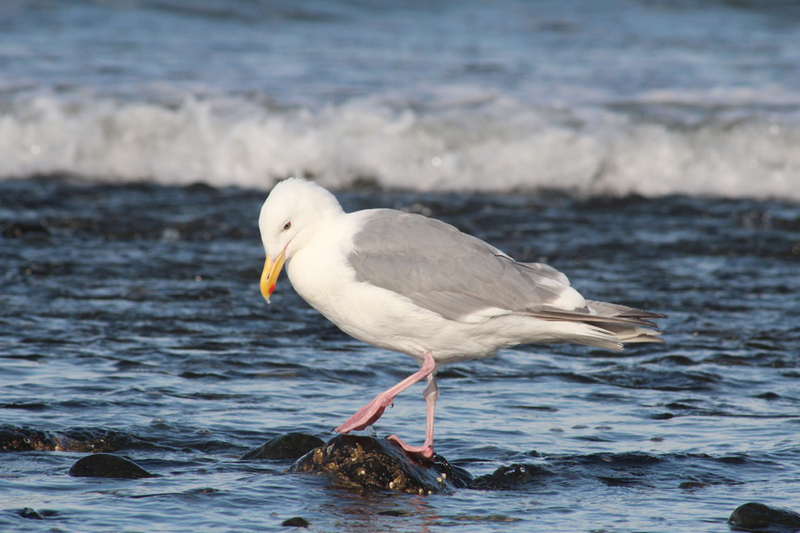 I often dropped my birding intensity to snap off some shots of gulls and anything else that would oblige, so that will be the focus of this post. Starting at Jordan River, I walked out to the big flock of gulls at the point near the river's outflow into the Strait of Juan de Fuca. The lighting wasn't conducive to getting photos of the two adult American Herring Gulls (Larus smithsonianus), so I opted to sneak in on a second-cycle Heermann's Gull (L. heermanni), an adult Glaucous-winged Gull (L. glaucescens), California Gulls (L. californicus) of three different ages. 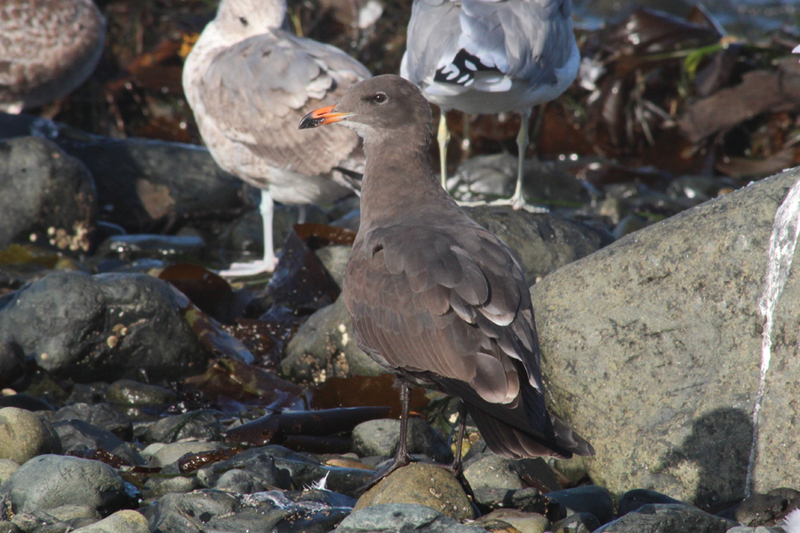 I have tentatively aged this Heermann's Gull as a second-cyle, but I am finding it hard to pin down for sure. I would think a third-cycle bird would have obvious grey to white tips on the retrices and the head would be grizzled with white. Does anyone have more experience in aging Heermann's or would someone be willing to give a better assessment by looking at the state of molt? Glaucous-winged Gulls are the standard Pacific Northwest gull. You can almost always find other gull species right through the summer, but this is the only species that breeds locally. 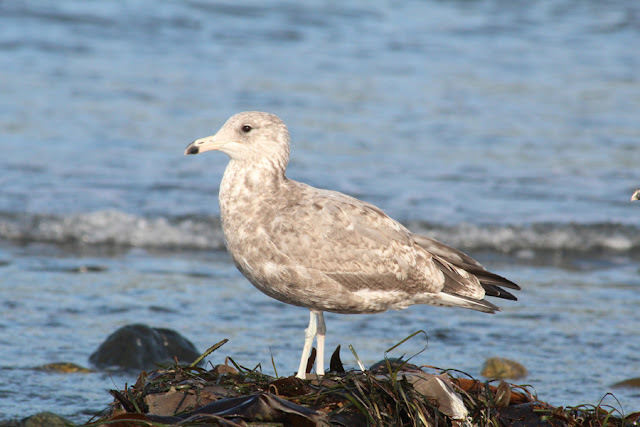 This adult shows primaries that more or less match the shade of the mantle, which is a classic Glaucous-winged feature. This first-cycle California Gull is not always easy to identify at first, but the strongly bicoloured pink-and-black bill with parallel edges and long, black primaries are good indicators. 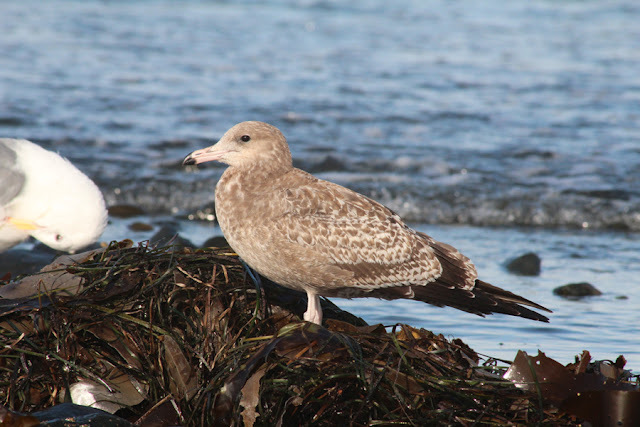 First-cycle California Gulls are known to be quite variable. This individual still shows all the same diagnostics as the previous one, but still manages to look different due to the dark mottling on the head. This species is quite common for over half the year, so it is important to become familiar with all ages. 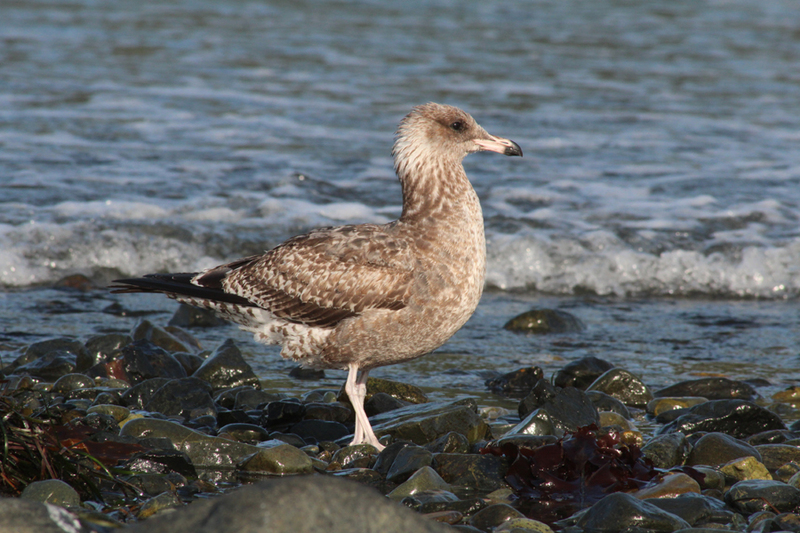 This second-cycle California Gull has several features that are different from the above examples of first-cycle birds. Most notably, the mantle has the odd pure grey feather filling in, the bill is pale pink and black with a pale tip, and the legs are a pale bluish-flesh colour. This is a classic adult California Gull. 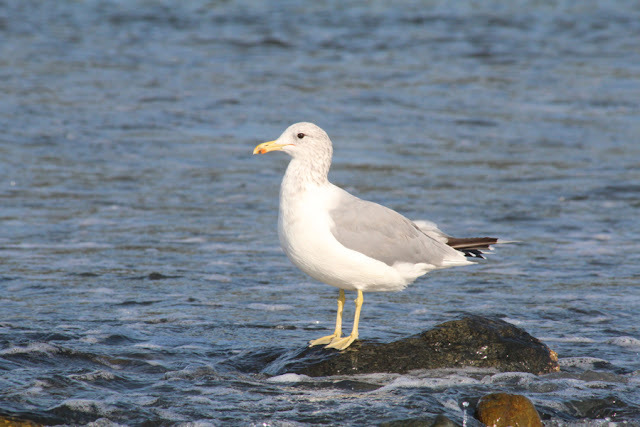 The legs are yellow, the bill has a red spot with a touch of black, the eyes are dark brown, and when in the company of other gulls it is medium in size. 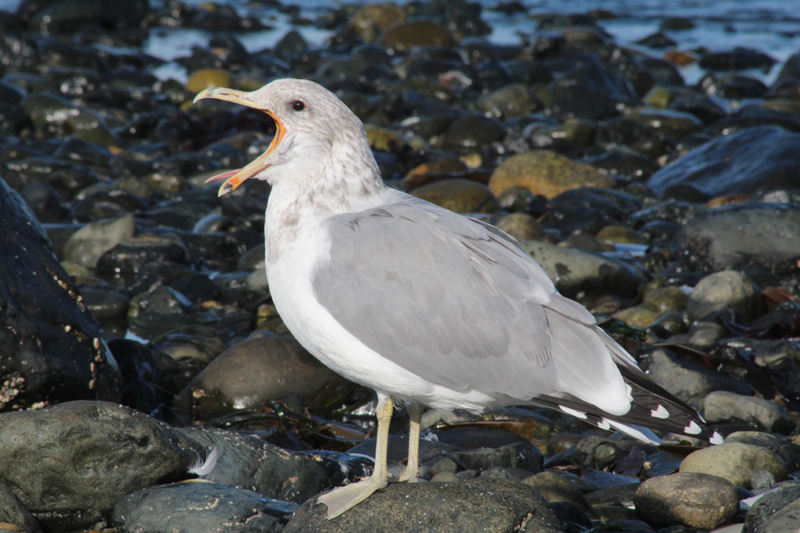 Here's another shot of an adult California Gull displaying its red gape nicely during a yawn. In Port Renfew, the rather slow birding caused me to seek out more shots. I started with a more worn juvenile California Gull. This California Gull appears to be an extremely worn juvenile compared to the two I photographed at Jordan River. This is another great example of how variable this species can be at this age. Even if the birding is slow, you can at least appreciate the scenery when you go to Port Renfew. The San Juan River estuary is truly a grand scene. I image crisp mornings with a slight fog or late afternoons with low sun from west create amazing photography conditions. I think the government should just install old pilings all along the coastline for tourism. I am pretty sure they always add a certain charm to the scenery. While enjoying the estuary's majesty, a Merlin (Falco columbarius) darted in to a patch of alders and was amazing cooperative. 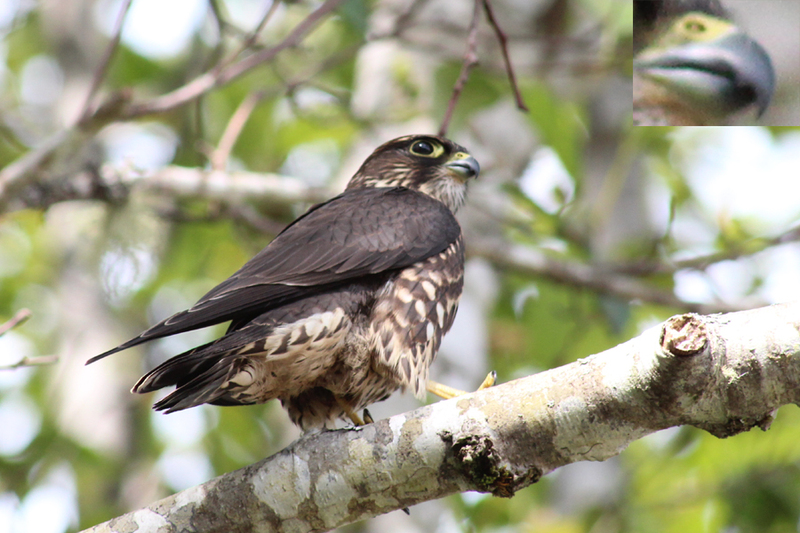 This dark little falcon belongs to the coastal subspecies suckleyi, which are sometimes referred to as Black Merlins or Coastal Forest Merlins. The inset (top right) shows the "tooth" that falcons have on their bill to dislocate the neck of their prey. In the Port Renfrew townsite, I managed to get a less-than-amazing shot of a Wilson's Warbler (Cardellina pusilla) and documented one of the many Eurasian Collared-Doves (Streptopelia decaocto) that have established there. 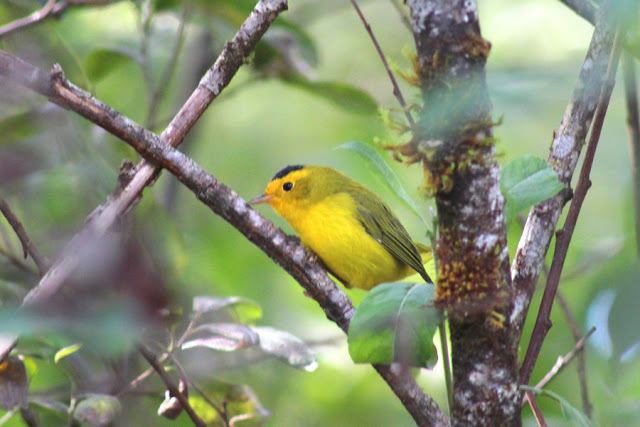 If you get a good look at a male Wilson's Warbler, there's no mistaking it! The male's solid, small black cap separates it from all other warblers. 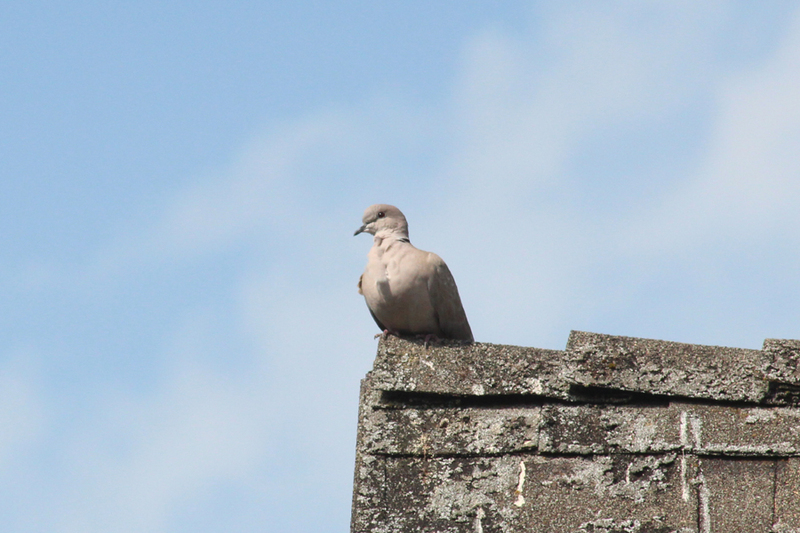 If you haven't seen any Eurasian Collared-Doves in your neighborhood, give it a year or two. In the last few years, they have managed to establish themselves quite firmly in many areas of southern British Columbia and reports have come from all over the province. 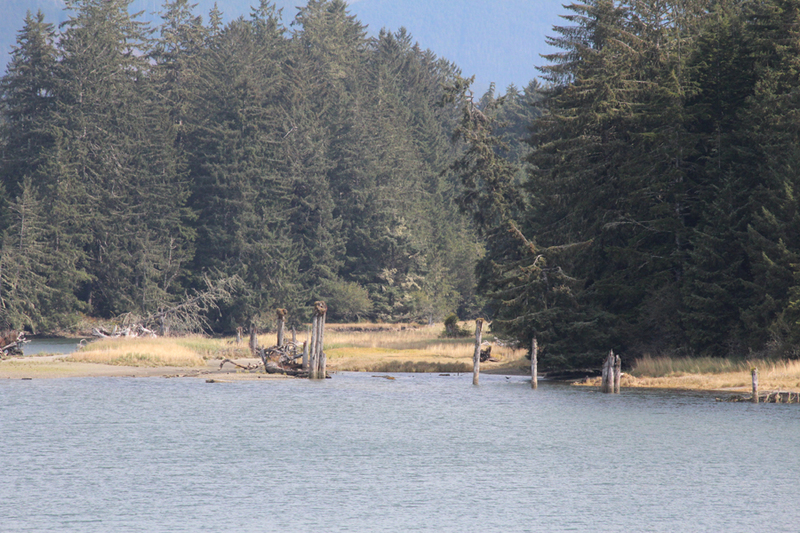 The last shot of this entry comes from a quick stop we made one our leisurely route back to Langford. We quickly popped in to a pond at the Metchosin Golf Course to see if any shorebirds were working the edge. Instead, we were treated to a lone Blue-winged Teal (Anas discors). 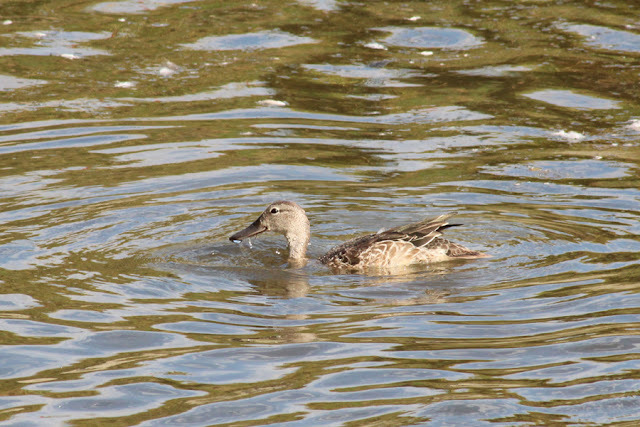 The dark eyeline, white eye arcs, and bill shape point to this being a Blue-winged Teal as opposed to a Cinnamon.